The human body is the collective body of large number of cells, which are in continuous growth, development, differentiation, regeneration, and death. The cells renew themselves by self-division. There are about 25,000,000 cells dividing in adult human body per second. And the dividing speed of the blood cells is about 100,000,000/s. During the process of dividing and growth, the nucleus and the extranuclear electron, the basic components of the cell with electricity, are making the high-speed movement and changing. In the meanwhile, the electromagnetic vases are radiating outward constantly. The electromagnetic waves stand for the different specific states of human body, such as healthy state, sub-healthy state and decease state.In different states, the corresponding electromagnetic waves are different. Thus, we can check out the human body state if these specific electromagnetic waves are detected. 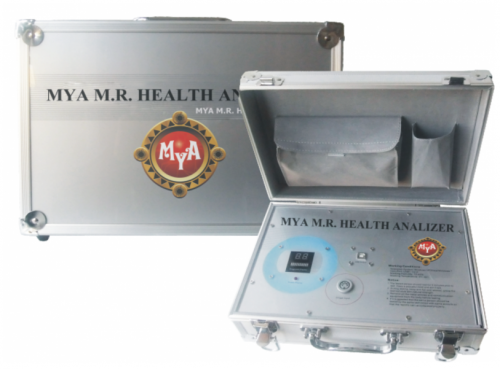 What is MyA Magnetic Resonance Health Analyzer? The MyA M.R. Health Analyzer is a high-tech innovation device, which is related to medical, bioinformatics, electronic engineering, etc. It is based on magnetic resonance medical, and scientifically analyzes the human body cell's weak magnetic field collected by advanced electronic device.The analyzer can work out the customer's health situation and main problem. According to the checking result, the analyzer can figure out the reasonable treatment recommendation. The MyA M.R. Health Analyzer is the individualized guide of comprehensive healthy consulting and updated healthy sciences, and its characteristics and advantages are comprehensive, non-invasive, practice, simple, quick, economical and easy to popularize. With the deep research and scientific development, the analyzer makes great contributions to human health. In Magnetic Resonance medical area, the fundamental reason for people suffering decease is that the spinning and the orbiting of the electron have changed, which makes the atoms change, which causes the biological micro molecule change. Therefore, the biological macro molecule change, gradually the whole cell starts to change. Since the electron is the charged body, when the spinning and the orbiting of it has changed, the electromagnetic waves inside will change accordingly. The energy of electromagnetic wave variation, which is caused by the different states of deceases and nutrition, is very weak, usually only Ns Gaussian or To Micro-Gauss. The frequency and the energy of the magnetic field are measured by holding the sensor with hand. It is similar to the theory of listening to the radio. There various wireless waves in the air, but if you want to listen the certain broadcasting station, you should modulate the radio to the same frequency, which causes the resonance, and then, the radio can get the specific radio station. Magnetic Resonance is based on this theory as well. Analyses without symptoms: With a simple alteration of the few cells ej: 10 cells, the equipment can the change and indicate the possibility of the beginning of an illness. This allows us to take the necessary measures in order to prevent many illnesses before they become deadly or chronic. Speed and precision: Various diagnostics can be made about the health status of an individual in a few minutes. This method was designed to save time and energy. The data base was created based on the scientific methods, strict statistics of treatments and proof of many clinical case; therefore it is precision equipment for an analyses of health. This study will be performed without a need to draw blood or X-rays. The operation is very simple; any person is able to do the analyses and interpretation with only a few hours of training. The study can be done at any place and at any time. Think on your health, save time, and money. Buy it now!